Tuesday: 7/26 Ugh, overslept/hit snooze for 6am marathon training again. After work, I did 3 x 800s on a treadmill at the rock climbing gym with a half mile warmup and recovery jogs in between. I was pressed for time because of my 6:30pm belay class but glad I got in some speedwork. Less than 3 miles overall, though. Wednesday 7/27: 5.2 miles of a park loop in the morning. I only had 2 ShotBlocks for breakfast instead of my usual frozen waffle with almond butter (ok, cookie butter) so I was struggling a little. I did 5.2 to compensate for Tuesday’s 2.8 miles. 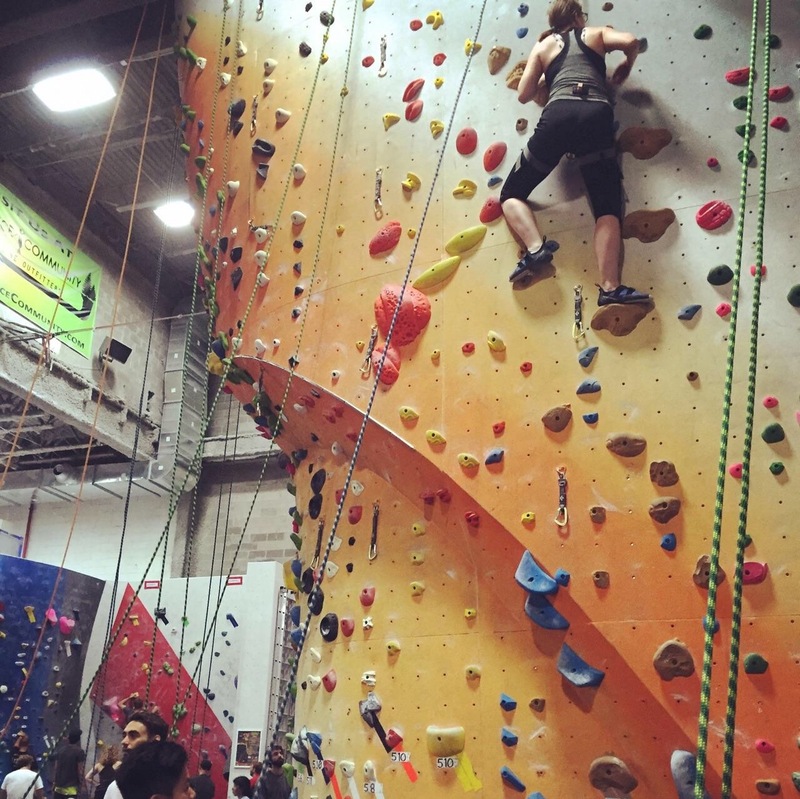 At night, I went to the rock climbing gym and climbed with friends for a couple hours. I tried a 5.6 and 5.6+ route and was pretty sore the next day. Thursday 7/28: I planned to run commute to work, but ended up run commuting home from work. I took Google’s recommended route home from a bar in Long Island City (after drinking just water and eating only cake). It went along the BQE for a while as well as the Orthodox South Williamsburg area and there were a lot of long lights, so I will try a more pedestrian-friendly route next time. I did get a feel for the Pulaski Bridge, which is part of the NYC Marathon route. 6.3 miles total and I ended it at Bklyn Larder to buy fondue provisions for a work lunch the next day. Friday 7/29: Rest day. Ate a ton of delicious foods at work because we had an international food potluck. 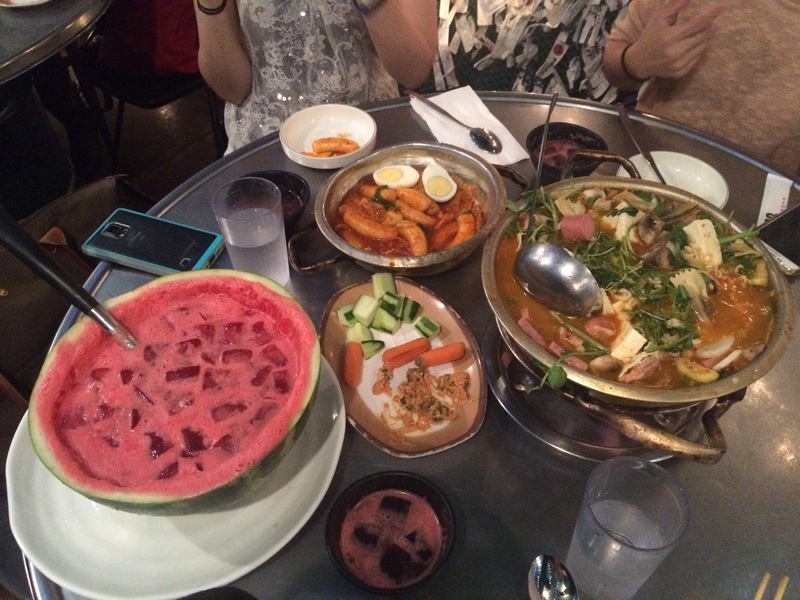 Went out at night with coworkers and ‘carb loaded’ with ddukboki and budae jigae at Pocha 32 (along with some watermelon soju). Then wisely drank lots of water at the bar. 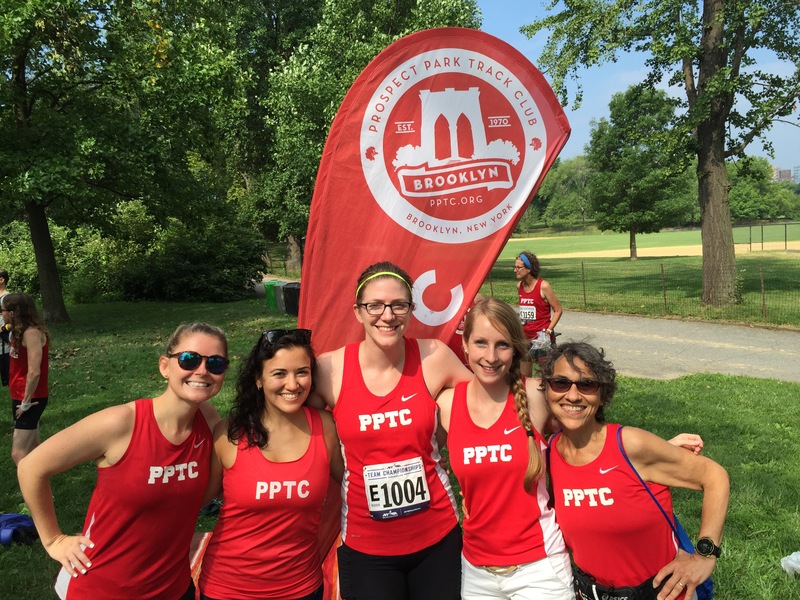 Saturday 7/30: NYRR Teamp Champs Race! Virtual Trainer suggested 7 total miles, so a mile each of warmup and cooldown before and after the 5-mile race, but I didn’t have time for even a half mile warmup. 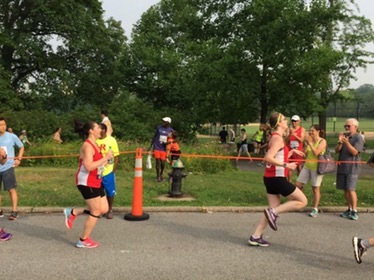 The womens’ race began at 7:30am this year (moved up an hour because of heat), so I knew I would have to do 2 miles after. I originally had loftier time goals for this race (sub-9 or close for every mile) but my current conditioning plus the humidity led me to believe I should adjust my goals toward something more reasonable. I asked a few pals what their pacing plan was and latched onto a teammate’s who was trying for 9:15ish then dropping for the last 2 miles. 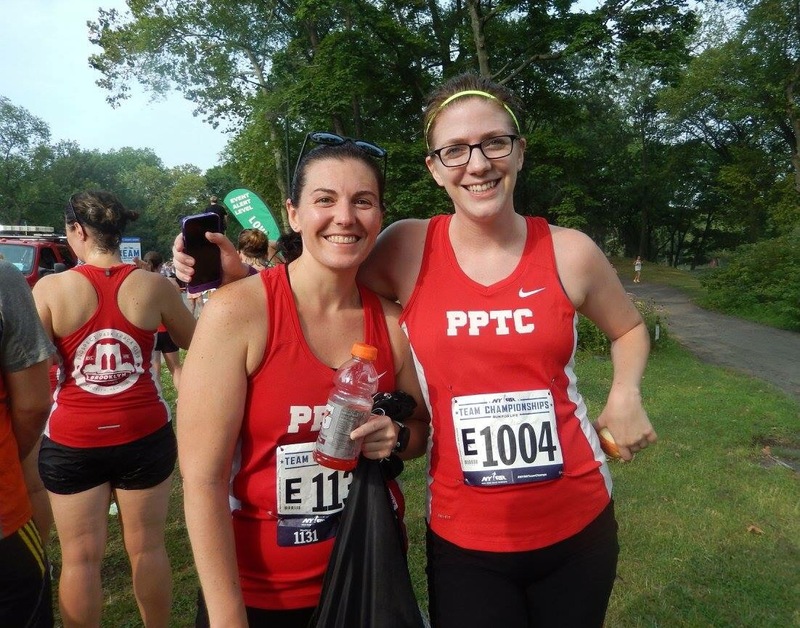 We ran 4.8 miles of the race together and her positivity was so helpful during it. Well, we took the first mile a little too quick and the hills on the next 3 were not great. I got confused by the last 200-400 meters of the race and accidentally hit stop too early on my Garmin, then restarted. But my official race time was 46:51, so that part is right. I ended up with 2.3 after because I got confused on the bridal path and around the reservoir. 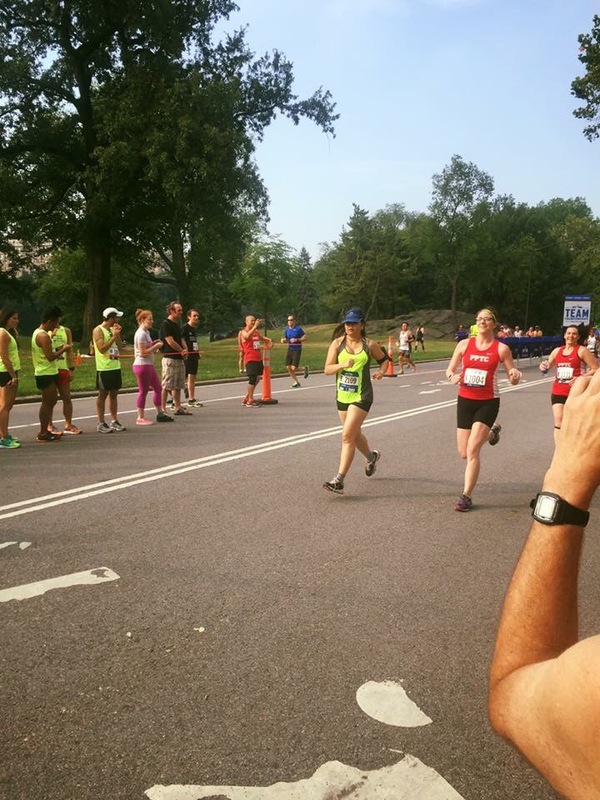 I expect to hit up Central Park for my long runs more soon, including the dreaded 18-mile tune-up in mid-September. Sunday: Quick 1.2 mile shakeout run to Bagel Pub, where I got an everything bagel (toasted) with bacon scallion cream cheese and a peanut banana smoothie. Total: 22.8 miles out of a recommended (by NYRR Virtual Trainer) 23 miles. So close! This was my highest mileage week ever, but they will of course continue to increase. it was neat to hear that your Mom’s plan is already different than mine and see how personalized it really is! Now to see if the France Run or 18-mile tune-up adjust my goal at all. Sorry, but it has to be said: *BRIDLE* PATH! It’s for horses, not for getting married. Just ask Coach Cane. Nice work for week 2! lol I’m going to pretend that was an autocorrect error but yes I am embarrassed. no horses on the path Saturday, though. See you at the Yelp event tonight!